Today I was in a very casual mood when I put on my clothes for my GizzA shift. The accessories are from Elysium and the leather strings kinda repeated the amazing ‘rasta look’ of the hair style and they did not overlay the whole style too much. And now… time to work! We <3 RP meets Skinfair or [sys] meets Elysium? Exactly like this happened to me a few days ago. I put on one of the newest releases of Elysium for the Skin Fair 2016. The “Candice Skin” totally caught my heart. With the cute freckles and the amazing skin tones, I really wanted to blog that wonderful skin. 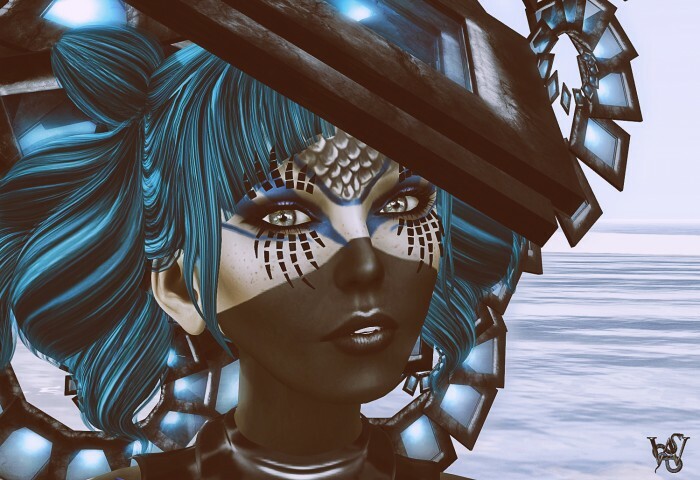 I comes with all kinds of appliers for the mesh heads and bodies, but for my first post with the skin I wanted to use my very own avatar face as the skin looked so cute on it. What I appreciate a lot, Elysium offers the same skin as well for the default avatar including the head, which is a real rare case lately and the more I ould love to spotlight Elysium skins for that as well. I was so disappointed when I went to the skin fair and saw nearly only appliers for mesh heads but no default avatar skins anymore. I can see the need for mesh head appliers as many do like to use their mesh heads. But as well I know enough ppl who like to stick to their avatar heads still – or even wanna change around between mesh and default – to keep their uniqueness and personality. I am not saying I hate mesh heads, I just was very disappointed to not being able to look for a new skin, if I do not wear any of those. The second item I wanted to talk about is the item, that [sys] has on the actual round of We <3 RP. The set comes with a HUD to customize colors and fabrics. The basic armor can be changed to 5 different colors of metals and structures. For the light parts you get the choice between teal, rose and silver/gray. The cool collar and chains as well come from [sys] and were made for the Whore Couture event. I am everything but a good builder… and usually if I try to set up something it never looks like I want it to. I adore people like Anderian Sugarplum or Daffodil Crimson, who can create amazing scenarios and sets.